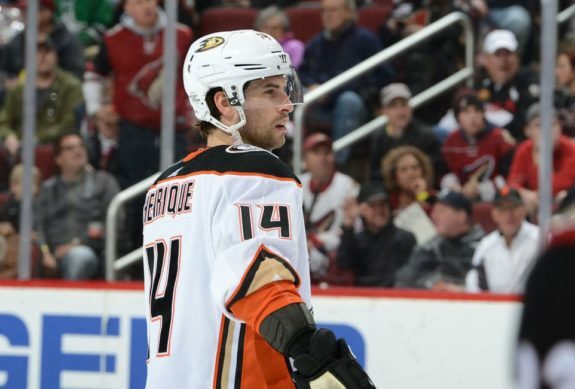 It’s gone from bad to worse for the Anaheim Ducks. Down 2-0 in their first-round series against the San Jose Sharks and needing to win Game 3 in Silicon Valley to make this a competitive series, the Ducks instead lost in embarrassing fashion, falling by a score of 8-1. They now trail the series 3-0. Game 3 was actually tied 1-1 after the first period, and the Ducks seemed to have some momentum going into the middle frame. They controlled much of the puck possession early on in that period, but a couple of successful odd-man rushes for the Sharks put them ahead before the wheels ultimately fell off for Anaheim. It was another frustrating night for the Ducks. There is a lot that can be dissected from this latest debacle, but here are three takeaways. The Sharks blitzed the Ducks with their familiar aggressive attack early in the game while the San Jose crowd was amped up for the opening portion of the game. The speedy Mikkel Boedker surprisingly blew by stout Ducks defenseman Hampus Lindholm before backhanding a pretty centering feed for Logan Couture, who buried it for an early 1-0 San Jose lead. The Ducks eventually settled down and had the better of the play for the latter half of the first period. Rickard Rakell finally got on the board with a one-timer goal on the power play, and Anaheim went into the first intermission with reason to feel optimistic. San Jose, though, would wipe that out quickly. Just over a minute into the second period, Brandon Montour lost an edge once again, but this time the consequences were dire. It resulted in a 2-on-1 rush for the Sharks and a Joonas Donskoi goal to put them ahead for good. With the Ducks still pressing hard on the attack, the Sharks got another outnumbered rush that Marcus Sorensen converted. From there, things really started to unravel for the Ducks, who took numerous penalties as their frustration became evident. San Jose would continue to pile it on long after the result was known, finishing the night with eight goals—four of which came on the power play. So much for that discipline the Ducks needed to exercise after Game 1. San Jose’s speed and depth have proven to be too much for the Ducks to overcome to this point in the series. The Sharks have consistently made the Ducks pay with their quick, aggressive attack and finishing ability off the rush, and they are getting contributions from up and down the lineup. Their eight goals in Game 3 came from eight different players. Anaheim has simply had no answer, and this is against a team that does not even have its top playmaker in veteran center Joe Thornton. While the Sharks have seen a bevy of goals from numerous sources, the Ducks have only managed to score three in the entire series so far. Only one of those has been at even strength. Rakell lighting the lamp was a welcome sight, but they are getting nothing from their other forwards. Jakob Silfverberg is their only other forward with a goal in this series. Ryan Getzlaf, Corey Perry, Adam Henrique, Ondrej Kase, Andrew Cogliano, and Ryan Kesler all remain without a goal. 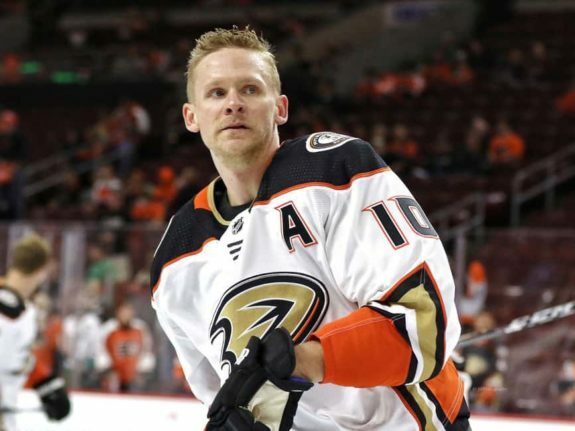 Before things spiraled out of control in the second period, the Ducks managed to apply some pressure on the Sharks and generate a number of decent chances, but their finishing ability was and has been non-existent. The third period also saw them get some chances, but, despite 46 total shots on goal, they could not find the back of the net once after Rakell’s first-period goal. Martin Jones made 45 saves for the Sharks, playing a calm, nearly flawless game as his team continued to tack on goals. Meanwhile, the Sharks’ high-danger shots and outnumbered attacks were too much for even star goalie John Gibson to handle, and he was eventually lifted for Ryan Miller after the second period, by which point Anaheim trailed 5-1. It’s hard to blame Gibson for much of what’s transpired in this series, but it’s also hard to argue that Jones did not outplay him in Game 3. The goal Gibson yielded to Eric Fehr—San Jose’s fourth of the night—was one he normally stops. He’s also been beaten three times this series on the same cross-crease, forehand-to-backhand move from his blocker side to his glove side. Granted, it’s one of the hardest moves for a goalie to stop, because if he cheats to his far side, the shooter can just beat him with a forehand shot. Nevertheless, Gibson has been unable to find an adjustment that works. Again, there is a litany of reasons ahead of Gibson for why the Ducks find themselves down 3-0 in this series. But it’s problematic that the single biggest advantage Anaheim seemed to have coming into this series—goaltending—has been not only nullified, but now flipped around. Jones didn’t have to do anything spectacular in Game 1 or Game 2, but his 45 saves on 46 shots in Game 3 certainly qualify for that description. It’s the icing on the cake for a series that has seen the Sharks outplay the Ducks across the board. Barring the Sharks blowing a 3-0 first-round playoff series lead to a team from southern California (that surely has never happened, right? ), the Ducks will be going home soon.